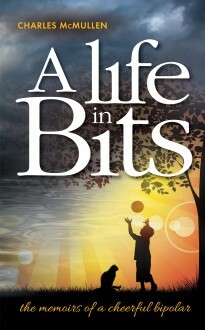 A Life in Bits is the moving story of one man’s battle with bipolar disorder, a condition whose devastating consequences are still not fully appreciated by the world at large. Charles McMullen’s battle with manic depression, as it is often known, began with a nervous breakdown at the age of nineteen. In his twenties, the suicide of his brother, his own divorce and the loss of his job and his home put him inside a psychiatric hospital. Yet despite the periods of appalling despair and the continued setbacks, Charles can still write at the end of the book ‘Overall, it’s been a pretty happy life’. This inspirational book will be of great interest to anyone who is afflicted by bipolar disorder, or knows one of the many people – roughly one in 25 of the population – who are.